Some weeks ago, I was standing out front of a traditional Italian grocery wearing a Knights of Columbus smock raising money for programs that serve the mentally disabled. I wish university fund raising were this easy. I waved my giant Tootsie Rolls, and watched cash flow into my tin can. At one point, a silver-haired man emerged from a Camero to hand me a dollar. In my mind’s eye, I saw my father-in-law, Gregory Perrone. Like many of the people dropping money into my can, Greg was a Republican who enjoyed his Camero, pro football, and Rush Limbaugh. He and I disagreed about just about everything. Movie star handsome and a gifted photographer, Greg was struck down decades before his time by lung cancer. He was a wonderful man. He walked the walk on many things, not least being that he spent 35 years caring for his disabled son. In less challenging circumstances, I was sucking wind after one-tenth of that time. Greg and I were wise enough never to discuss abortion. So I don’t precisely know what he believed. I know enough to know that we disagreed, and that I liked and respected him despite these differences. Such relationships don’t shake my emphatic belief that women should have the right to abortion, and that abortion is often morally justified. I wish our society would show greater respect for the millions of women who have terminated their pregnancies. I wish Americans took more seriously the serious reasons women have for making this choice. If you doubt me, watch this 1983 Frontline documentary, which shows the human reality at one abortion clinic. Then watch this recent documentary about how a relentless, often illegal campaign is eroding women’s access to reproductive health services. Because of this campaign, and because of legislation flowing from the “partial birth abortion” debate, our nation compounds the difficulties of women facing medical crisis or tragedy by restricted their access to needed care. The blogger Hilzoy recently alerted me to Martha Mendoza’s wrenching account of losing her baby 19 weeks into pregnancy. Mendoza spent days trying to find a hospital and doctor able and willing to perform the D&E procedure required to remove the dead body inside her. That said, one should acknowledge that abortion is never an easy issue, morally, politically, or any other way. Its quandaries are too intimate to our humanity to be painlessly addressed. Abortion is unlike (say) gay marriage or contraception. On these latter matters, liberals must navigate difficult politics under the long shadow of cultural tradition to change cultural practice and public policy. In the end though, there is only one morally credible position. We should be polite and all. Yet fundamentally, liberals are right, and conservatives are wrong. Abortion is different. Serious arguments can be made from many sides. Reasonable people disagree for reasons that deserve mutual respect. Pro-choice liberals must honor--though certainly not defer to--the seriousness of those who hold pro-life views. 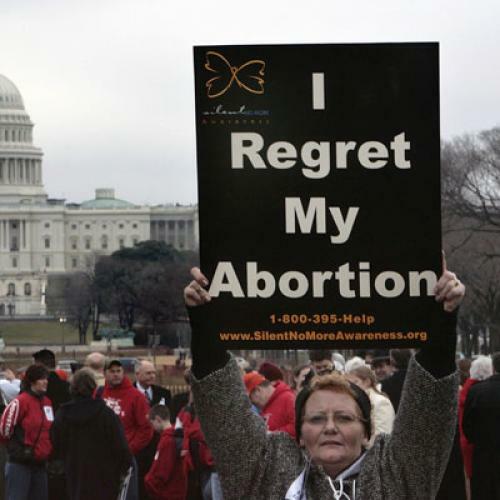 I cannot begrudge religious conservatives who seek to persuade women not to have abortions. One can oppose Roe vs. Wade without being an evil person. One can picket an abortion clinic--though not get in the face of a frightened pregnant patient--in an honorable fashion. It would be easier to graciously acknowledge the seriousness of social conservatives if they were to grant us the same courtesy. When we ponder public support for embryonic stem cell research that may relieve human suffering, there are “values voters” on both sides of the table. Conservative culture-war rhetoric exudes resentment of liberal elites. Yet poor women are the actual victims of the resulting policies. It was a political given that the public option would not cover abortions. Now the House bill is marred by amendments that may effectively bar plans listed on insurance exchanges from covering abortion. The hypocrisy is noteworthy. According to conservatives, no government or insurance company bureaucrat should come between you and your doctor--except when it comes to the most intimate and difficult choice women face. The affluent do not tolerate being bullied by moralizing politicians. Poor people are more vulnerable to economic pressure. Representative Stupak and his allies exploit this vulnerability to impose values they have singularly failed to spread in the rest of America through less-coercive means. There is a civil conversation to be had among people of goodwill on both sides here. I was reminded of this possibility by a nice column by Ross Douthat about Ted Kennedy and Eunice Kennedy Shriver. I generally disagree with Douthat, but he expressed something real here. Ted Kennedy’s tireless efforts on issues like health care, education and immigration were explicitly rooted in Catholic social teaching, and so was his sister’s lifelong labor on behalf of the physically and mentally impaired. What separated them was abortion. Along with her husband, Sargent Shriver, Eunice belonged to America’s dwindling population of outspoken pro-life liberals. Like her church, she saw a continuity, rather than a contradiction, between championing the poor, the marginalized and the oppressed and protecting unborn human life. A few politicians, such as Marcy Kaptur of Ohio, follow Kennedy Shriver’s path. Kaptur has a reliably liberal voting record on economics and civil rights. She is pretty reliably pro-life, too, even on embryonic stem cells where so many Americans depart from their churches’ opposing positions. The Catholic Church’s own stance on immigration and welfare policy are closer to Ted Kennedy’s than to William Bennett’s. Pro-life and pro-choice legislators sometimes find common ground. Dana Goldstein has noted one part of Senator Kennedy’s legacy Douthat overlooked. Alongside conservative Sam Brownback, Kennedy co-sponsored the Prenatally and Postnatally Diagnosed Conditions Awareness Act. Kennedy and Brownback were disturbed that so many parents who receive challenging prenatal diagnoses choose to terminate a pregnancy. The senators sought to ensure that couples who receive challenging diagnoses are counseled about the positive life possibilities open to people living with Down Syndrome and other disorders. Kennedy’s pro-choice stance did not detract from his lifelong efforts on behalf of the physically and mentally impaired. Some of these efforts--not least the fight for universal coverage--made the front page. Others never reached beyond the Federal Register. Some pro-life legislators such as Orrin Hatch have done the same. We can honor the achievements and the humanity of both Kennedys, knowing that we must disappoint one when the rubber meets the road on measures such as the Stupak amendment. We have to fight right now; I’m not looking forward to it. On all sides, we have so much to do in caring for the disabled and in covering the uninsured. The politics of abortion poisons so much of what it touches. We can’t allow it to poison health reform, too.